Thailand is known for its mouth-watering street food, sacred temples, beautiful beaches… and it is not surprising to spot Bangkok, Chiang Mai, and Phuket in the travel plans of every tourist coming to this country. 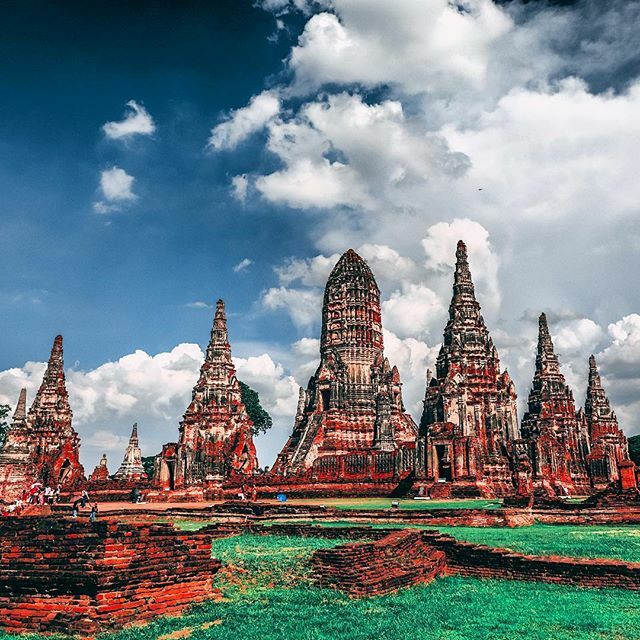 Yet, in order to learn about the history of the ‘Land of Smiles’, a destination that you sure do not want to miss is Ayutthaya, the second capital after Sukhothai. 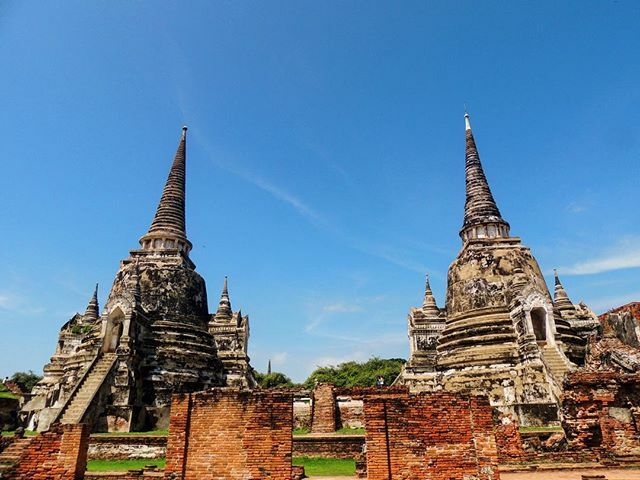 Visiting Ayutthaya is one of amazing things to do in Bangkok. Although the city of Ayutthaya was largely destroyed by the Burmese in the 18th century, it is still bursting with stories to tell. Wandering around a site of more than 700 years of age under the guidance of an experienced local guide will leave you awestruck with the splendor of ancient architecture and with a new perspective on the Thai spiritual life. 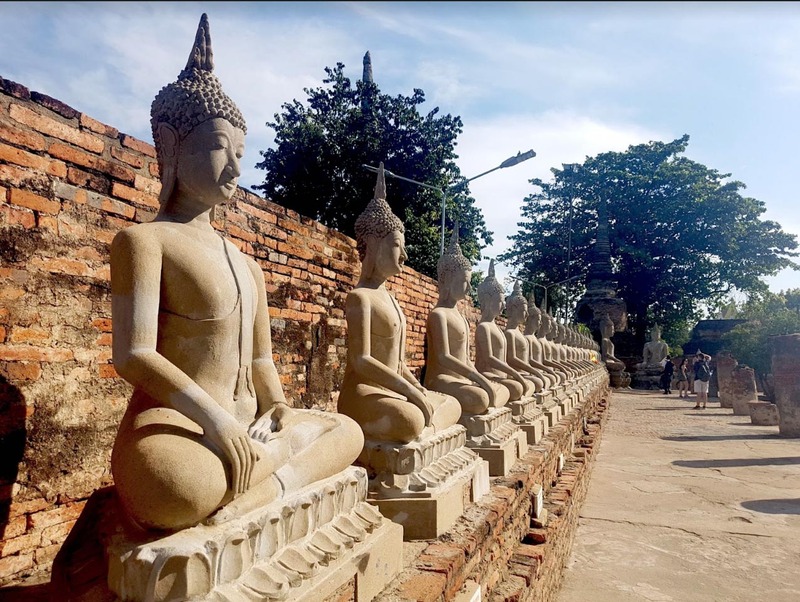 This article will provide you with a detailed guide for an Ayutthaya day trip from Bangkok, including how to get there, the history of the place, suggestions of interesting activities, food specialties as well as some useful tips you should know prior to your trip. 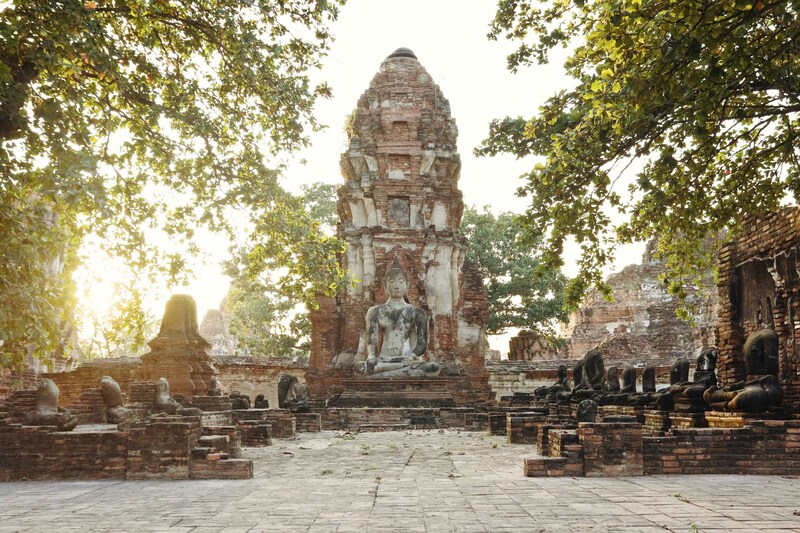 Located 85 kilometers to the north of Bangkok, Ayutthaya is not hard to get to. Depending on your budget, you can opt for taxis, trains, bus, minivans or tour groups. If you do not have much time and want absolute convenience, a taxi can serve you well with approximately 1,000 baht. You can also negotiate with the driver to take you there, drive you around, and then back to Bangkok for roughly 2,500 baht. The train leaves from Hualamphong Station in the city center. It takes around 2 hours a half and costs 300 THB for first class, or 35THB for the third-class carriage. When you reach Ayutthaya, you can jump on a tuk-tuk to go around the city for 60THB. Although this can be the most time-consuming of options, your breath will be taken away at the sight of green rice paddies, pure fresh ponds, and peaceful herds of water buffalos chewing grass. There is a half-hourly bus that leaves from Mo Chit Station. It takes about 90 minutes to get to Ayutthaya. First, take an MRT or BTS skytrain to Mo Chit Station. After that, take a taxi or motorbike taxi or jump on bus number 26, 77, 96, 104, 136, 145, or 509 to get to the right bus section to Ayutthaya. The bus ticket price is 60 baht per person. Minivan is the fastest option, only taking about 75 minutes. Go to Victory Monument, take Exit 2 and turn at the bottom of the stairway. The van loading station is on your right between the mall and a 7-Eleven convenience store. At the station, prepare 100 baht and get on a van directly to Ayutthaya. Another favorable and convenient way to have day trip from Bangkok is book a tour. 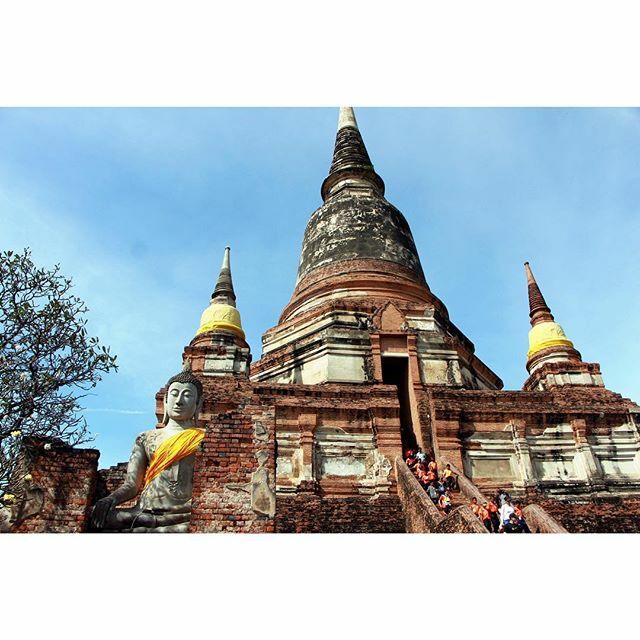 Inspitrip offers some best Ayutthaya day tours by road and cruise with local guide at a reasonable price at $52. 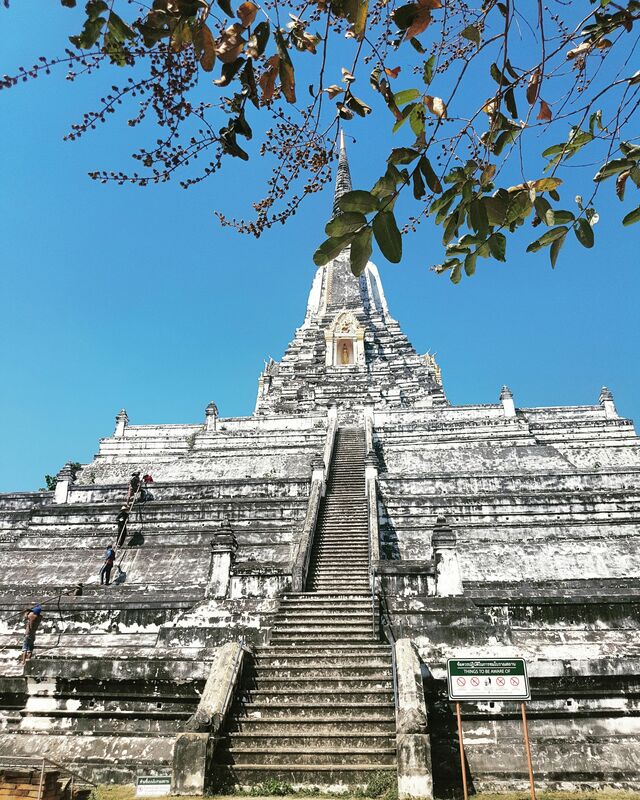 These tours includes lunch at a local Thai restaurant, air-conditioned transport, all entrance fees, pick-up and drop-off at your accommodation, and an English-speaking guide. It is named after Ayodhya, India, the birthplace of the hero Rama and also known as “Pra Nakhon Si Ayutthaya”, which was the capital city of Thailand for 417 years from the mid-1300s to the mid-1700s. The Ayutthaya period can be considered the golden age of the Siamese people under the governing of 33 kings. By the year 1700, the city of Ayutthaya had become one of the world’s largest cities at that time with the total of 1 million inhabitants. Not only did the kingdom get along well with the neighboring countries but it was also a major trading hub for international traders from Eastern and Western nations. However, Ayutthaya could not stay clear of frequent invasion. In 1758, the country was in total chaos because of the competition of Royal succession in the Royal Family. This lead to the catastrophic defeat in the war against the Burmese in 1767 after several conflicts provoked between the two realms. The Burmese decided to burn down and demolish almost all magnificent structures belonging to the Ayutthaya Kingdom. This is the origin of the ruins that we can see nowadays. Wat Phra Si Sanphet, or the temple of the Buddha Si Sanphet, was first built in the 14th century and reached the peak of its glory in the second half of the 17th century. Being a part of the Royal Palace complex, the temple used to be a place where the royalty performed rituals. On that account, there were no resident monks here. They were only invited here on special religious occasions. 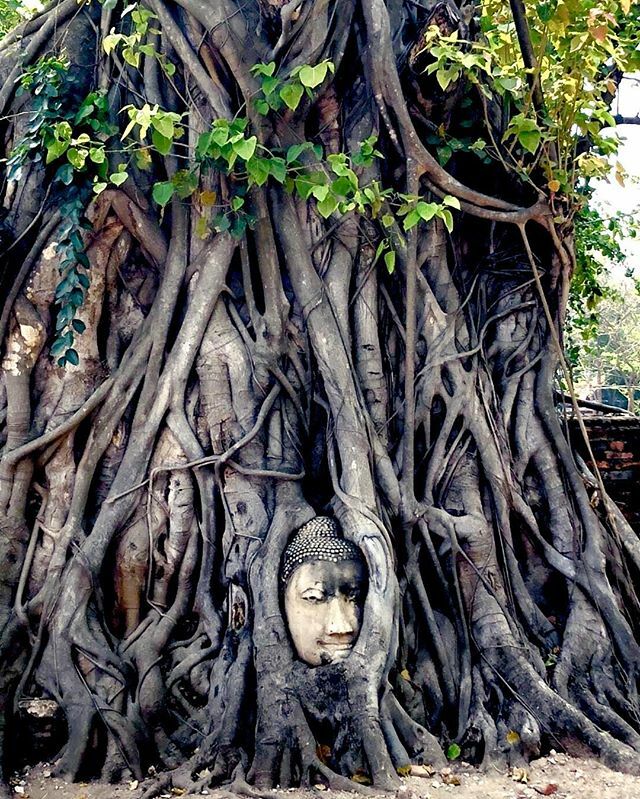 The Buddha head entwined within the roots of a banyan tree is one of the most recognizable symbols of Thailand and it can be found here in Wat Phra Mahatthat. Like the other temples in the area, this one was so severely destroyed that you will see a line of headless statues. And it is its ramshackle appearance that attracts thousands of visitors to go there every week. 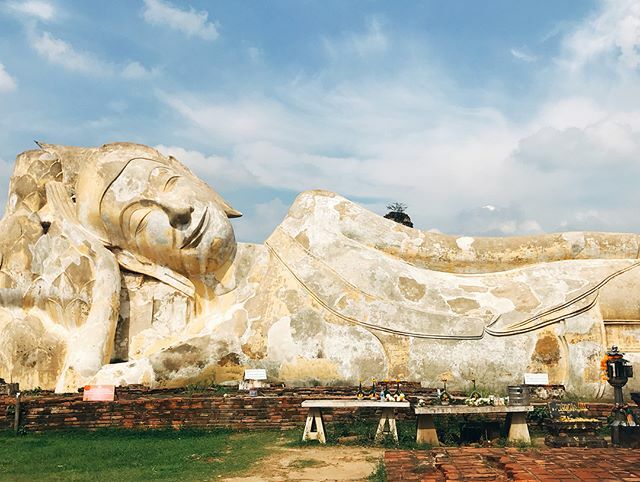 Wat Lokayasutharam is a popular pilgrimage site of Thai Buddhists and a must-visit destination of foreign travelers because it has gained a name for a giant reclining Buddha, which represents Buddha lying down, and is a major iconographic and statuary pattern of Buddhism. The statue was lucky to be left intact compared to other structures in Ayutthaya Historical Park. Commissioned by King Prasat Thong in 1630, Wat Chaiwatthanaram was built in traditional Khmer style, similar to Angkor Wat in Krong Siem Riep, Cambodia. The whole structure stands on a rectangular platform with a central 35-meter high prang, a tower-like spire, surrounded by four smaller prangs. Although ruined, Wat Chaiwatthanaram is still a compelling sight to visit. 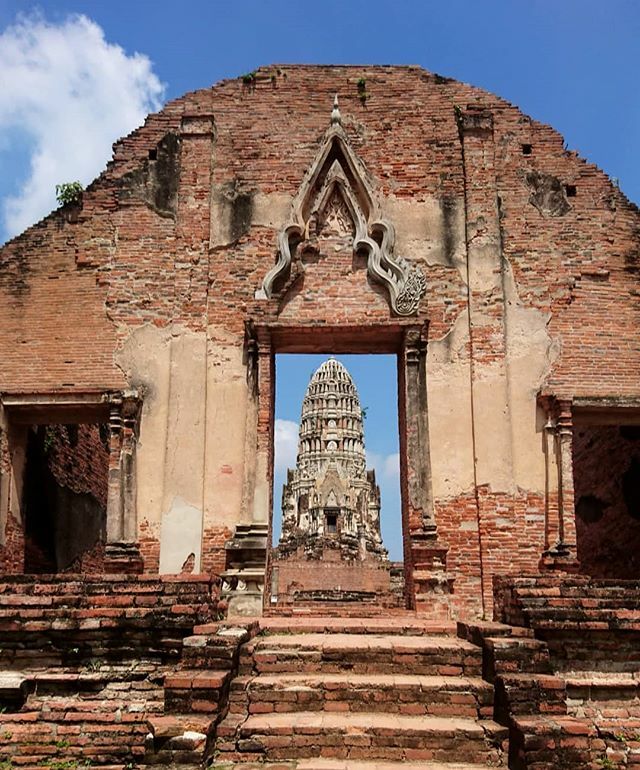 Wat Ratchaburana can be regarded as the most well-preserved ruins in the Ayutthaya Historical Park area. The commissioner – King Borommarachathirat II – decided to construct the temple in 1424 on the cremation site of his two elder brothers who died in their fight for the throne. Located across the road from Wat Mahathat, it must be seen during an Ayutthaya day trip. You cannot leave Ayutthaya without savoring a dish of boat noodles, the specialty of Thailand’s ancient capital. 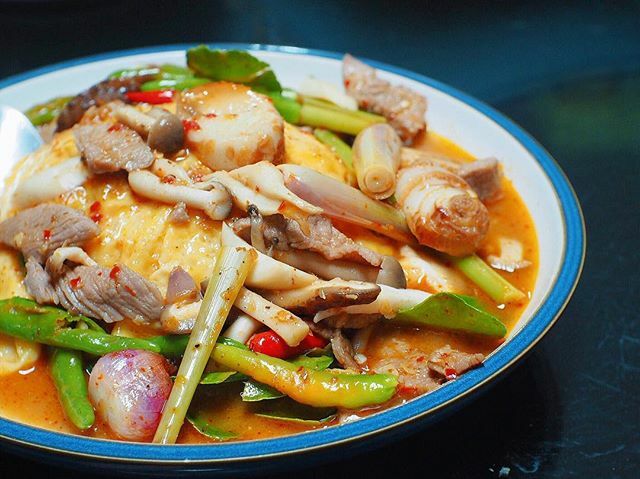 Originally, it was cooked and sold in the boats on the canals and rivers, but these days, most of the boat noodles are available in the eateries alongside the road. 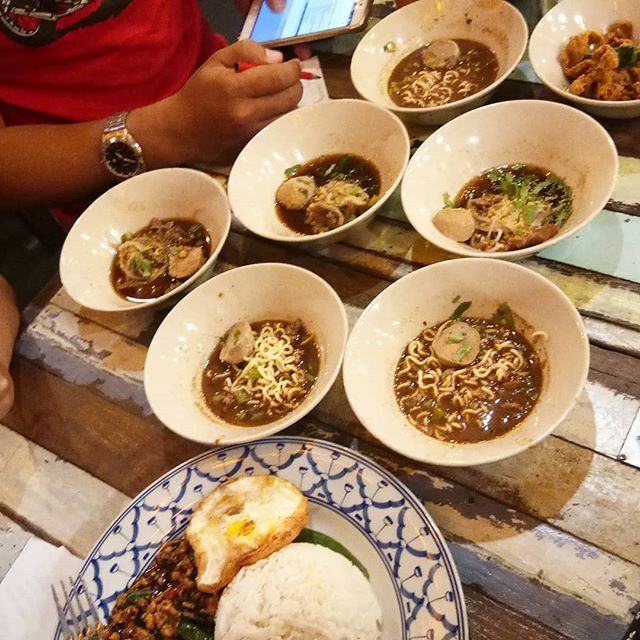 The boat noodles are often served in small bowls and you can choose what ingredients to put into your dish. 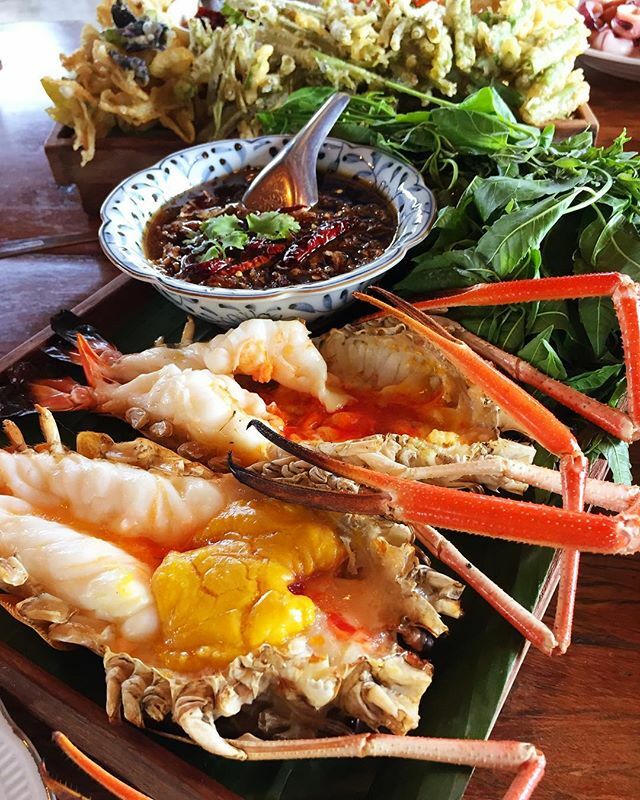 Once you are in Ayutthaya, take a bite of a fresh giant river prawn available at several riverside restaurants. The creamy juice in the shrimp’s head covered in salty sauce is the closest to heaven on earth. Though it is kind of pricey, I promise that you won’t regret it. If you have a sweet tooth, Roti Sai Mai is unmissable as it is considered the preferred dessert in Ayutthaya. 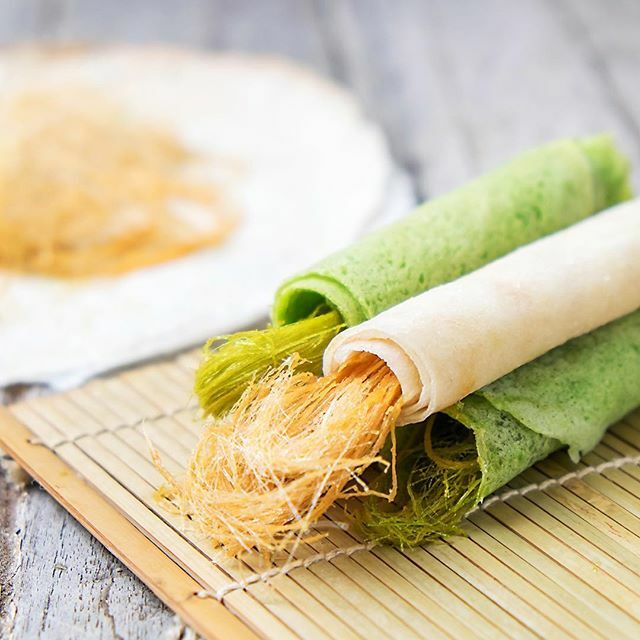 There are various kinds of Roti but the typical one is made with the cotton candy that comes in different colors wrapped in salted crepes. What’s more, you can have a chance to try making one from the hot pan of some vendors. Tom kha kai is a well-liked Thai food. 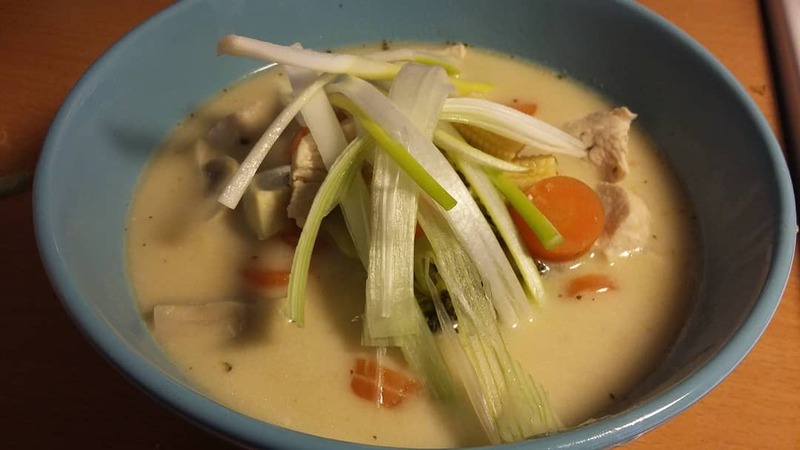 A bowl of spicy and sour hot chicken soup with coconut milk will whet your appetite and make it impossible for you to stop eating it. As one of the most well-known dishes in Thai cuisine, a sumptuous bowl of Tom Yum soup consisting of noodles with crabs, prawns, scallops, with minced meat and a hard boiled egg is another nom that you would not want to miss. 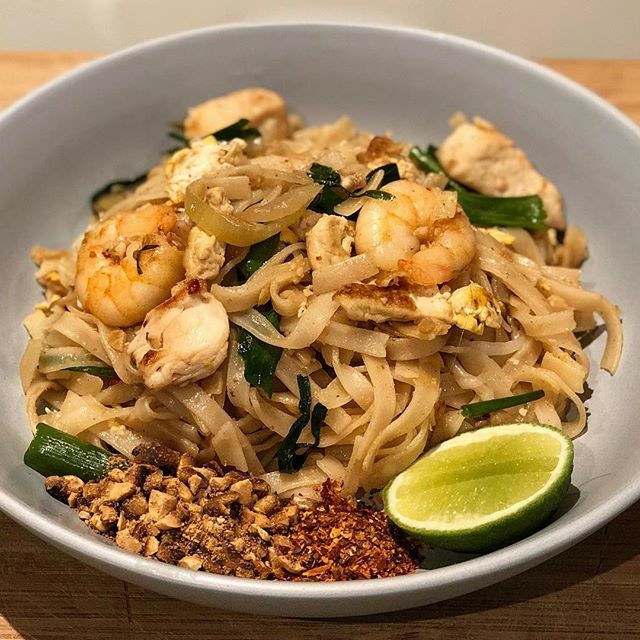 Pad Thai, a stir-fried noodle dish with eggs and tofu, is a national Thai food that you cannot avoid bumping into wherever you go in Thailand. You should try it at least once if you ever visit the country of smiles. You can find long-tailed boats at the harbor in the Northeast of the island near Hua Ro Market. It is highly recommended that you join the boat trip in the evening so that you can see the temples illuminated in the darkness of the sky. At Ayutthaya elephant camp, you will be taken by an elephant to go around some of the city ruins. You can also learn about how the elephants are trained and cared for. Despite the fact that the floating market is built for touristic purposes, it is still very local. You can see people wearing traditional Thai costumes, and buy some clothes, souvenirs in shops and stalls. The highlight of the floating market is the food. You will be able to have your food cooked on boats and served on decks next to the boats. When coming to the museum, you can spare some time to remind yourself of your glorious youth by looking at the old toys, such as cars, dolls, spaceships, stuffed animals, just to name a few. Million Toy museum was founded by Professor K. Yoonpun, who often comes here to read stories to the children. Spending one day in Ayutthaya is more than enough. A local guide is in your best interest. It is more or less impossible for you to learn about the history and the meaning of every temple on your own. Bring along a hat and a bottle of water with you since you may be wandering around temples under the sun for a long period of time. You have to dress formally when it comes to visiting the sacred temples. The ideal time to visit Ayutthaya is from November to February. It is the hottest between March to May and the weather is rainy from June to September. If you plan a 3-day trip in Bangkok, you should spend a whole day staying overnight at Ayutthaya. Hello! Where are the minivan stops/terminals in Ayutthaya going back to Bangkok?Thanks! Vans and buses leave from Naresuan Road. Buses on the north side, taxis on the south. Between the bridge over the klong and Wat Mahathat. Both take around 1 1/2 hours (if traffic is OK).